The folks at Metro are planning on building a Regional Connector that will connect the train lines coming from Culver City to Union Station. So one of the plans is for this regional connector to go underground as it goes through downtown from the Westside, go East underground along Second Street and connect with the Gold Line extension on First and Alameda (connects Pasadena with East L.A. and Monterey Park). Well, one of the problems with this proposal is that it plans to come up in the block where Office Depot, Señor Fish, Weiland's, Izayoi and other restaurants are currently at. Which basically means goodbye Office Depot, Señor Fish, Weiland's, Izayoi and those restaurants. Oh yeah, goodbye to Starbucks too. I drew a map because I can't post Metro's renderings without their permission. It's rather crude but I hope it gives people a good idea of what the implications for Little Tokyo are. Another concern that I and others have is the amount of traffic that will flow through First and Alameda with this Regional Connector proposal. Metro estimates that there will be one train passing through every 2 to 3 minutes. Traffic along Alameda will be routed underneath instead of the other way around. Convenience: the Regional Connector will allow folks traveling from Culver City to travel to Pasadena or East L.A./Monterey Park and vice versa to stay on the train without having to get off the train and transfer to another train. Metro is pushing this idea as good for Little Tokyo, because it will bring more awareness of LT and potentially more visitors. I'm all for mass transit, but one train every 2 - 3 minutes bearing through an opening in the ground is to me less than desireable. 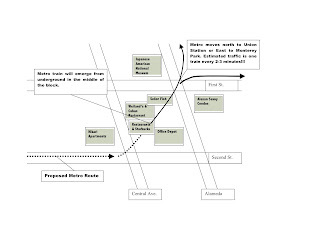 Not to mention, how is there going to be a continued connection with the proposed Nikkei Center, the Gold Line station and Nishi Temple with trains cutting through? And is this going to be safe? Will Nishi's day care center be affected with the traffic? How are they going to prevent kids from sneaking into the Metro opening? Build fences? Can someone say ... internment camp? I'm not sure this meeting is public or not, but I think people should show up en masse anyways. There is a concept of building a complex above the Metro exit so that it would look better. Another option a few months ago was to bring the Metro along Temple. I think L.T. should push for more options.